Year of Food & Drink has arrived on the Royal Mile! 2015 is exploding with the Year of Food & Drink ahead of us and we aim to be at the centre of it all! Our weekly spotlight on individual producers is a chance for you to celebrate Scotland’s natural larder and quality produce by meeting the producers face to face and tasting their products for the first time. May 14: The Whisky Sauce Co.
June 4: The Wee Tea Co.
We look forward to seeing you and introducing our local, Scottish food and drink producers! 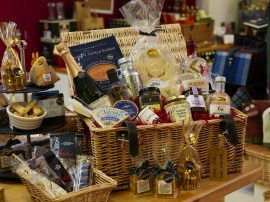 You can create a totally customised hamper filled with high quality Scottish food, drink and gifts for someone special. We can help with suggestions and pairings, but it is totally up to you what goes into your hamper. While we don’t have all our products available to view on our website, we are ready to help with a PSS (Phone-Shop-Ship) session where we walk around the shop with a basket and describe items to you over the phone and you select what goes into your Scottish Christmas hamper. We help our customers create hampers and baskets for any occasion, including birthdays, anniversaries and visiting business colleagues. Call Fiona and Beth on 0131 556 7194 to find out how we can help. We can take your payment over the phone and then make up the hamper to your specifications. We use a major shipper so your package is tracked and insured. Angela Pointon, St Andrews, Michelle Lowe, Tom Butcher & Tain Pottery pieces including candle sticks, mugs, egg cups, casserole dish and bicycle themed platters. Thank you to all our customers who have made our 3rd Christmas season a roaring success! It’s no secret that we love our customers because you love Scottish made products as much as we do. Thank you!! During January we will be recharging after a very busy 2014 and also searching for new food, drink and gift products. This chunk of time off gives us the chance to travel around Scotland and meet with some of our current producers. We’re hoping to make it to a couple new distilleries as well. If you know of any new Scottish products that you love, please let us know. What’s in store for 2015 you ask? 2015 is Scotland’s Year of Food & Drink so we will have a weekly spotlight on our individual producers to celebrate and promote Scotland’s natural larder and quality produce. We plan to introduce new people and new products to our customers and our visitors! This means lots of pop up producer tasting events in the shop, so if you haven’t already, sign up for our newsletter in the side bar. We will close at 3pm on Wednesday, 24 December. We will reopen at 11am on Sunday, 28 December and remain open through Saturday, 3 January 2015. We will be closed for the month of January, opening again on Saturday, 31 January 2015. What’s in store for 2015 you ask? 2015 is Scotland’s Year of Food & Drink so we will have a weekly spotlight on our individual producers to celebrate and promote Scotland’s natural larder and quality produce. We plan to introduce new people and new products to our customers and our visitors! This means lots of pop up producer tasting events in the shop, so if you haven’t already, sign up for our newsletter on our homepage. Looking for the perfect Christmas hamper this season? All our Christmas hampers are filled to the brim with the same quality Scottish food and drink we stock in the shop. Did you know that all our food and drink products have been produced in Scotland and many are Great Taste Award winners? We have designed 3 Christmas hampers with the highest quality Scottish produce and guaranteed to put a smile on the recipient’s face. Prices range from £50 to £150 and can be shipped ANYWHERE in the UK for £10. If you would like to create a personalised Scottish Christmas hamper all you need to do is give us a call on 0131 556 7194 between 11 and 6 GMT. We will include a card with your personal message and ship anywhere in the UK for £10. All orders should be placed by December 15, 2014. We are so proud to have been selected as a finalist in the 2014 Visit Scotland Thistle Awards in the ‘Warmest Welcome’ category. 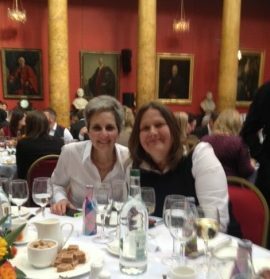 We shared a wonderful lunch at the Royal College of Physicians in Edinburgh with a table full of nominees including Afternoon Tea Tours and Pilrig House Apartments. We consider ourselves foodies so when we meet other foodies there’s pretty much nothing we won’t talk about, especially when it comes to Scottish food and drink. 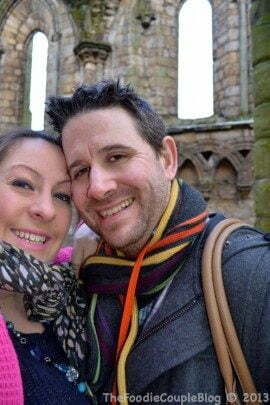 The FoodieCouple popped in to see us during their Valentines break in Edinburgh and between us our excitement was overflowing. You know when you’ve met kindred spirits! The FoodieCouple Blog highlights some of our personal favourite foodie places in Edinburgh as well as one of our Great Taste Top 50 Award winners Great Glen Game. Maybe on their next visit to Edinburgh they’ll invite us to dine along with them! 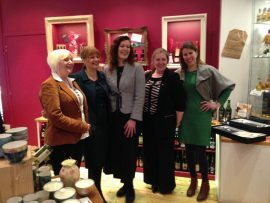 We had the great honour to host the Scottish Government launch of new support for women in business. The event launched the framework and action plan for women’s enterprise created by Women’s Enterprise Scotland. Download the plan. Guests were served Glen Lyon Coffee, Cindy’s Teas and Manna House Bakery & Patisserie. All the organic Scottish cheese you could ever want is right on your doorstep at Cranachan and Crowdie. Everything from your favourite humble cheddar to something you’ve never tried before is waiting to be discovered. All cheeses are locally sourced from respected farmers committed to bringing you the best in Scottish cheese. The Connage Highland Dairy, based in Ardersier near Inverness, is a fully organic family run business that uses traditional techniques and ensure every detail from cow to cheese is maintained to ensure the highest quality is maintained throughout the process. If you ever find yourself up in the Highlands, make sure you pop by the Connage Pantry and see their multi-award winning cheese being made before your eyes. 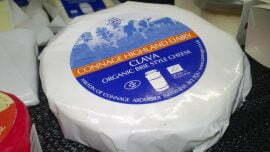 Cranachan and Crowdie stock many of the Connage Highland Dairy cheeses, including Clava Brie, Cromal and Dunlop. The Isle of Arran Cheese company is similarly family-run by the Kinniburgh family, who took over the company from Ian and Alison McChelry, and have lead the company from strength to strength. In this range you’ll find traditional cheddars with a twist, with added hints of chilli, garlic and mustard. And if you want a taste of more award-winning cheeses, look no further than Katy Rodgers’ crowdie from Knockraich Farm, winner of 3 stars at the Great Taste Awards 2012. If you feel like being yet more adventurous, why not try some black crowdie from Highland Fine Cheeses. This unusual combination of crowdie with oatmeal and peppercorns makes a cheese like you’ve never tasted before. Those with a taste for the unusual will love this crowdie with kick! For the ultimate flavour experience, why not give an I.J. Mellis cheese a try? The focus here is on exceptional taste, using artisan techniques and unpasteurised milk to ensure no flavour-defining characteristics are lost. Cranachan and Crowdie’s I.J. Mellis cheeses are all traditional cloth bound and include Isle of Mull cheddar, Grimbister and Cambus-o-May. With a mix of traditional and unusual, there’s a cheese at Cranachan and Crowdie to suit any taste buds. Don’t deny yourself these exceptional artisan cheeses!